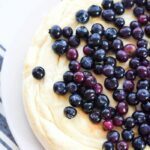 This New York Style Crustless Keto Cheesecake with Juicy Blueberries has all the flavors of a traditional cheesecake, but is sugar-free, crustless, and low carb! Going keto or low-carb doesn’t have to mean giving up some of your favorite desserts. When I first started a low-carb diet in July, I ended up throwing the towel in after just a month. While I did lose 17 lbs pretty quickly, I just was so turned off by what I thought was an overly restricted diet. I felt like I couldn’t eat anything! But, the second time around, I learned there are so many recipe adaptations that can be made low-carb or keto. 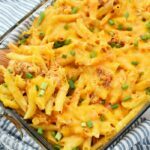 But, I want to make it clear– just because the ingredients in this recipe are keto-friendly, it doesn’t mean you can grab a fork and eat the whole thing. Eating desserts or certain foods in bulk could possibly kick you out of keto so make sure this fits into your macros for the day you indulge. I used a 9″ inch springform pan like this one. I greased it with melted butter using a paper towel. I have made many cheesecakes in my lifetime and have learned how to avoid cracks. Today, my cheesecake has some fine cracks because I immediately removed it from the oven so I could snap some pics to post fast enough to eat some tonight. But, here is how to prevent your crustless cheesecake from cracking. You will want to only use room temperature ingredients. This means that your eggs, sour cream, and cheese will need to sit out on the counter until they are room-temp. 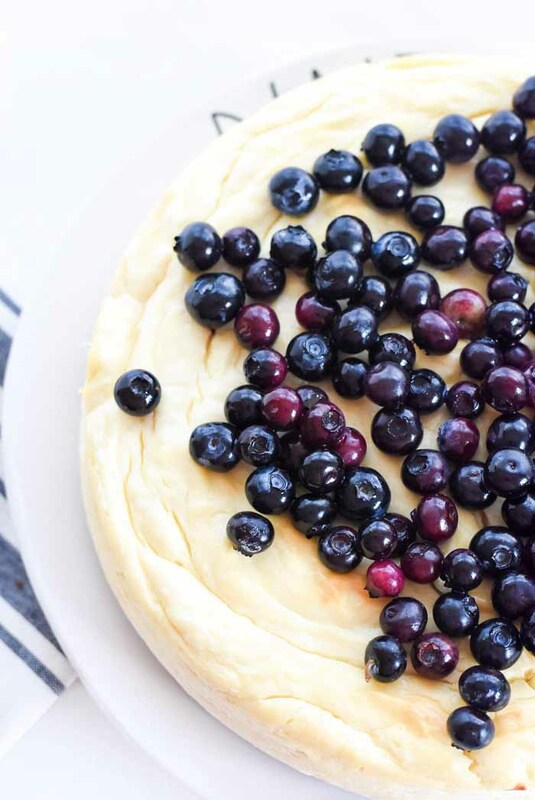 You cannot just use ice-cold ingredients because your cheesecake will crack, and be lumpy. You will want to wrap your springform pan with 3 sheets of foil to prevent water from seeping into your pan. I put one sheet under each side, and wrap it upwards to create foiled edges on all sides. Bake it on a thick baking sheet with 1 cup of water. Adding a water bath helps the cake from cracking due to the steam. Once your cheesecake is done leave it in the oven to cool. I know this sounds weird, but allow your cheesecake to firm up for 1-2 hours. A sudden pull out from the oven will cause it to crack fast! This tip ties into the last, but you should totally allow your cheesecake to come down to room temperature before chilling it. By chilling it for 6-8 hours, it will firm up nicely. My personal favorite sweetener is Sukrin Gold brown sugar. I know this sounds weird, but this keto friendly sweetener does not leave a bitter or yucky taste in your mouth like stevia can! But, if you do like stevia, you might want to try this Strawberry Crustless Keto Cheesecake. 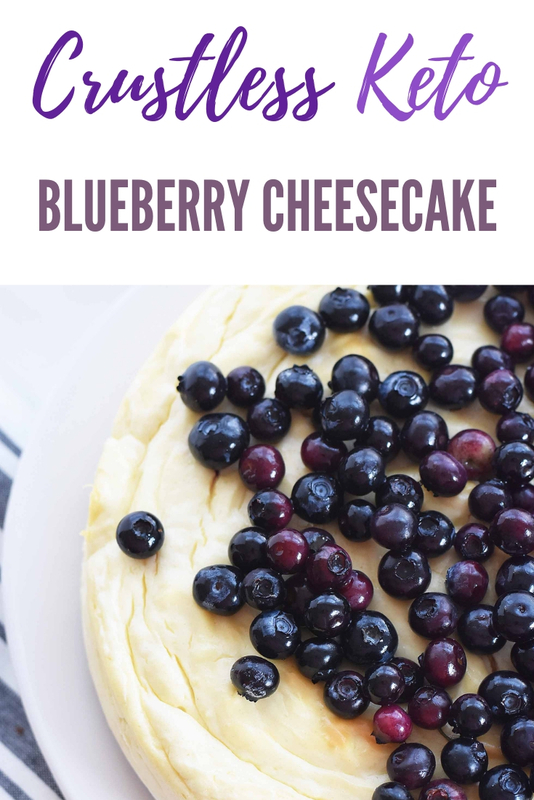 Since strawberries and blueberries are low on the glycemic index a few in moderation make a great topping for your cheesecake. 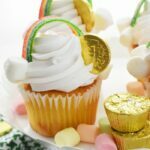 I warmed mine with a teaspoon of sukrin gold and a little water to get them glazed and sweet to top my cake. Today for aesthetic purposes I just quickly added these. You can cook them longer and make a compote if you please. 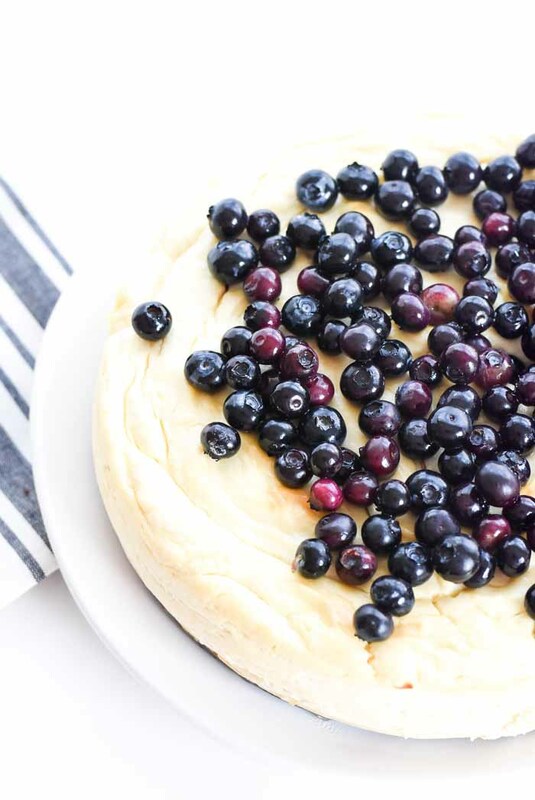 Get the printable recipe for this Low Carb Crustless Cheesecake Below! 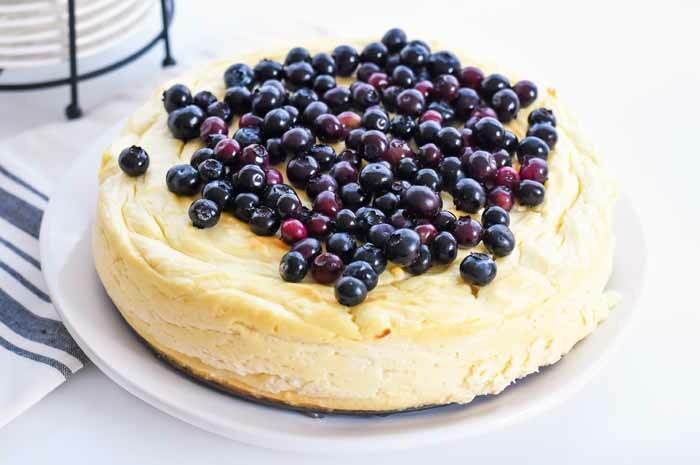 This Keto Cheesecake has all the flavors of a delicious traditional New York style cheesecake, but is sugar free and low carb! In a stand mixer, add your 4 blocks of room temp cream cheese. You want it to be room temp so it is easier to work with and it won’t crack the cake like cold cheesecake will do. Add in the extract, and Sukrin Gold. Add in the sour cream last and mix until just combined. Pour batter into a butter lined springform pan. Bake for one hour in a water bath (see above tips) at the 325 degrees f.
After the hour, allow cake to cool in there for an additional hour. 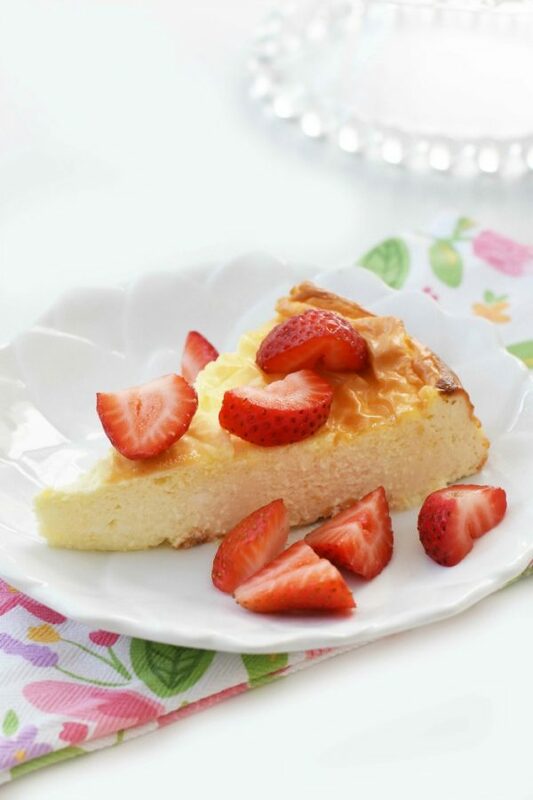 Get this Crustless Strawberry Cheesecake Recipe here on the site too! 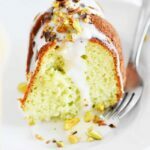 Want a creamy keto dessert? 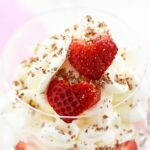 Try this Whipped Cream & Strawberries dessert too!